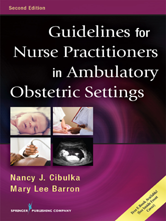 The only comprehensive source of current, evidence-based guidelines for nurse practitioners, nurse-midwives, clinical nurse specialists, and other health professionals who provide prenatal and postpartum care in outpatient settings, this clinical reference covers the latest health care guidelines. 2. Screening for Genetic Disorders and Genetic Counseling—Preconception and Early Pregnancy Cibulka Nancy J. 6. Antenatal Fetal Surveillance Cibulka Nancy J. 7. Postpartum Care in the Ambulatory Setting Cibulka Nancy J. 8. Postpartum Complications Cibulka Nancy J. 9. Oral Health and Oral Health Problems in Pregnancy Cibulka Nancy J. 10. Iron-Deficiency Anemia in Pregnancy Cibulka Nancy J. 11. Respiratory Illness During Pregnancy: Upper Respiratory Infection, Influenza, and Asthma Cibulka Nancy J. 14. Dermatoses of Pregnancy Cibulka Nancy J. 18. Hypertensive Disorders of Pregnancy Cibulka Nancy J. 19. Preterm Labor Cibulka Nancy J. 20. HIV-1 and Pregnancy: Screening, Diagnosis, and Management Cibulka Nancy J. 21. Zika Virus and Pregnancy Cibulka Nancy J. 22. Disaster Planning for Pregnant and Postpartum Women and Their Infants Cibulka Nancy J. and Colby Fischer Anna J.
C. Common Approach to HIV Testing in Pregnancy for Barnes–Jewish Hospital: A Consensus of the HIV Perinatal Working Group of Washington University School of Medicine Cibulka Nancy J.